We've had very mixed weather conditions in the last week that have brought everything from blazing sunshine, hailstones, torrential rain and 100 mph winds to the area. 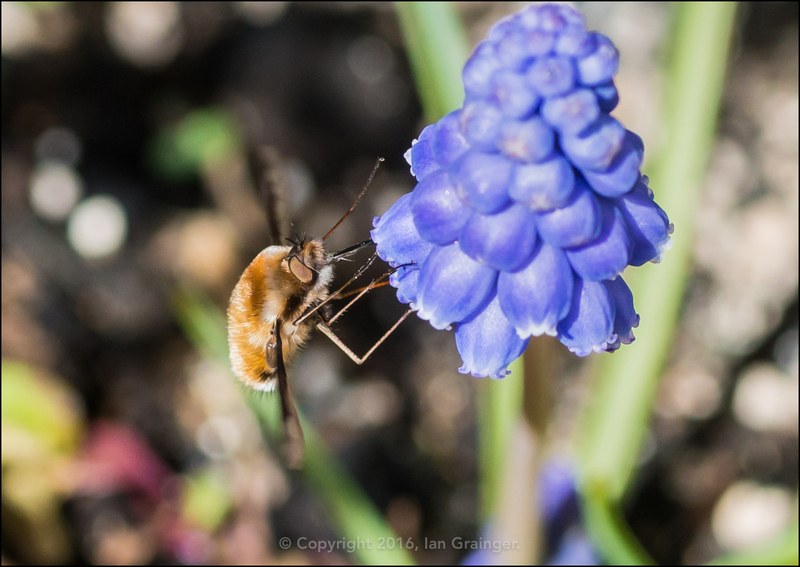 Good Friday lived up to its name, and brought with it some gorgeous weather, along with this wonderful looking Bee Fly (Bombylius major). 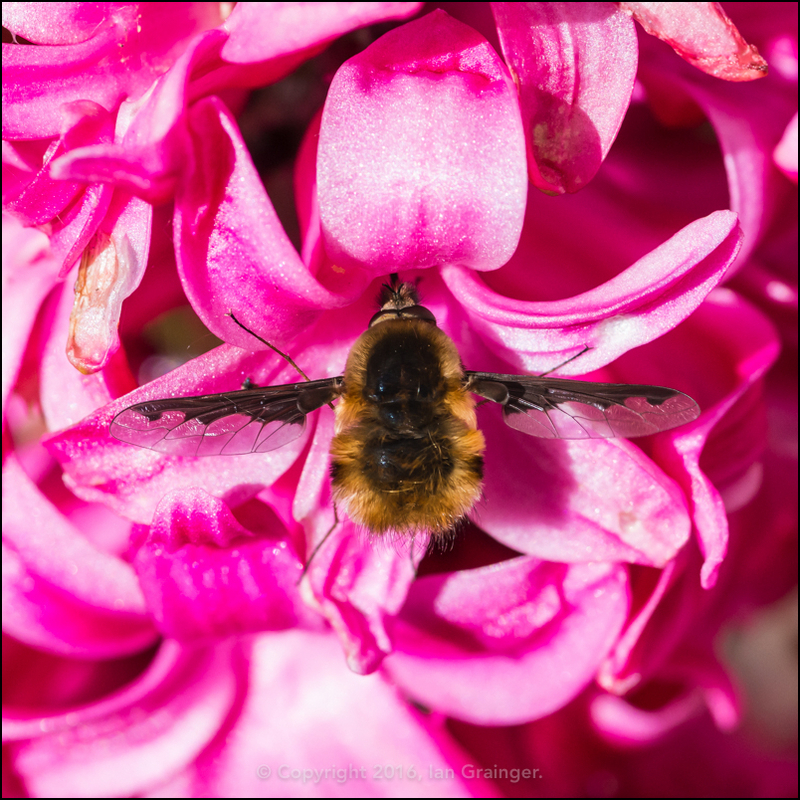 I don't usually get them visiting my garden, but was thrilled to see this one sampling the delights of my pink Hyacinth blooms with its very long proboscis. 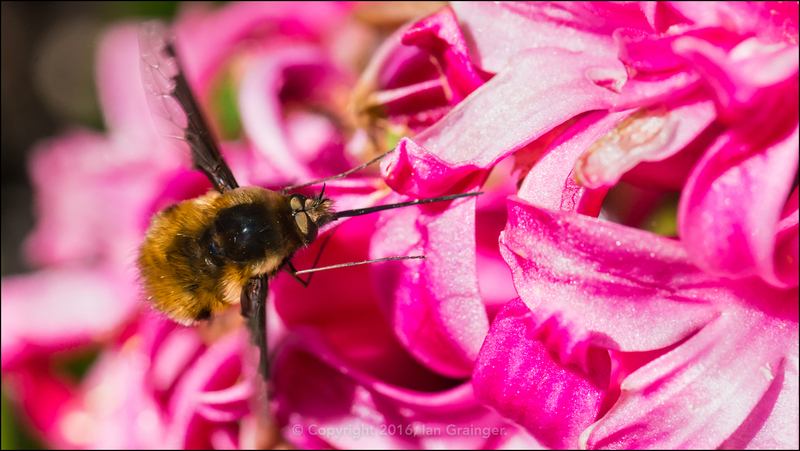 While looking like a Bumblebee (Bombus), the Bee Fly, as its common name suggests, is not a Bee, but a Fly, and is a member of the True Fly (Diptera) order of insects. Although the long rigid proboscis looks quite threatening, it's quite harmless, and is simply used for probing into flower heads to get at the sweet nectar inside. 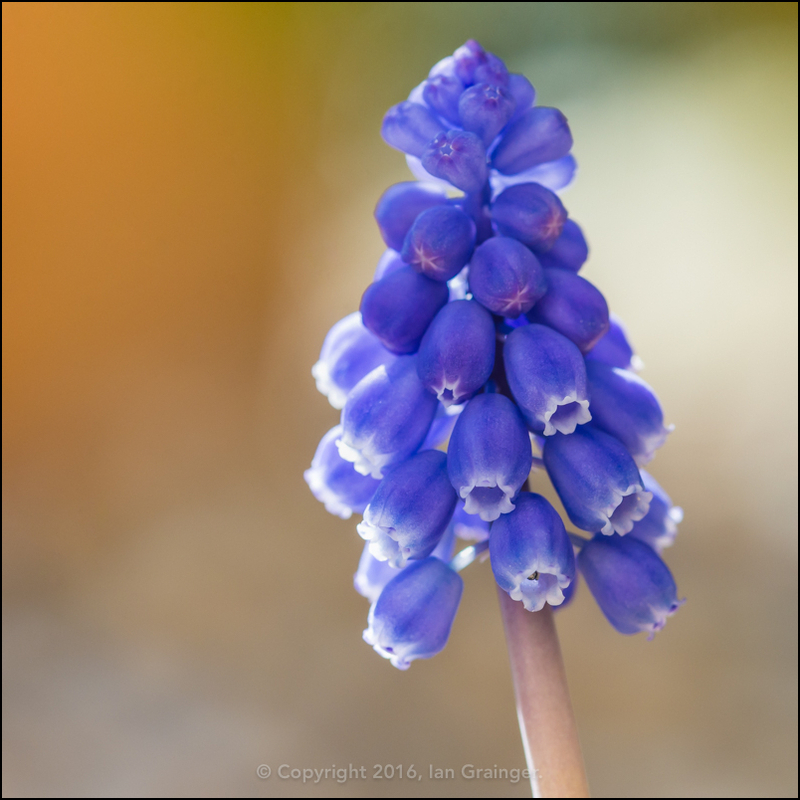 It was perfect for getting inside the Hyacinth and these Muscari florets. Grape Hyacinth (Muscari) have to be one of my favourite flowers at this time of year, and I love how the little blooms (or should I say bloomers) look, especially when bathed in full sun. 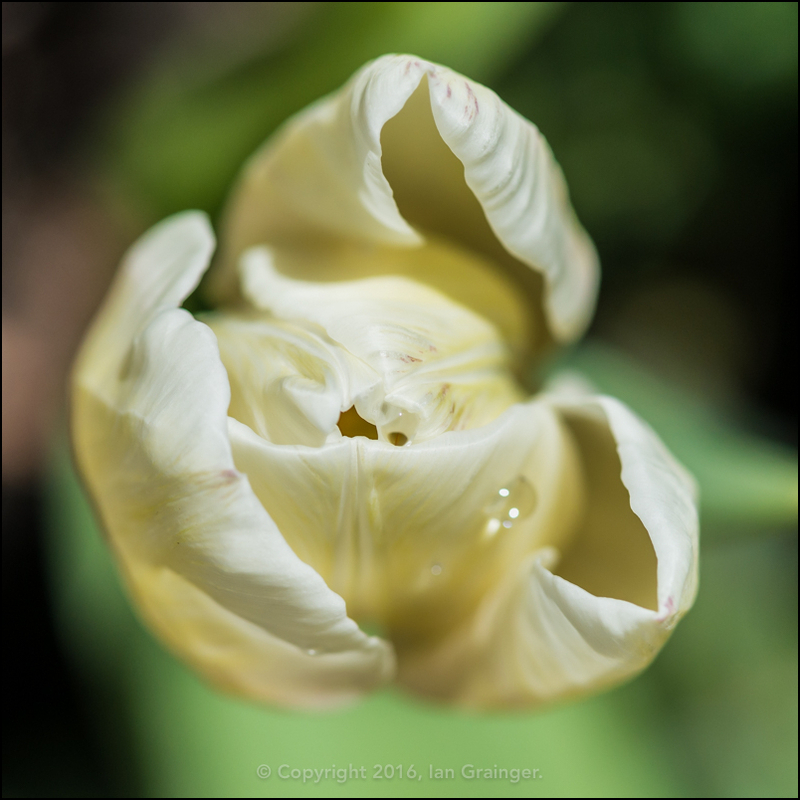 The warm weather has even encouraged my first Tulip of the season to appear. Although this particular one didn't last long due to the aforementioned wind and hail. 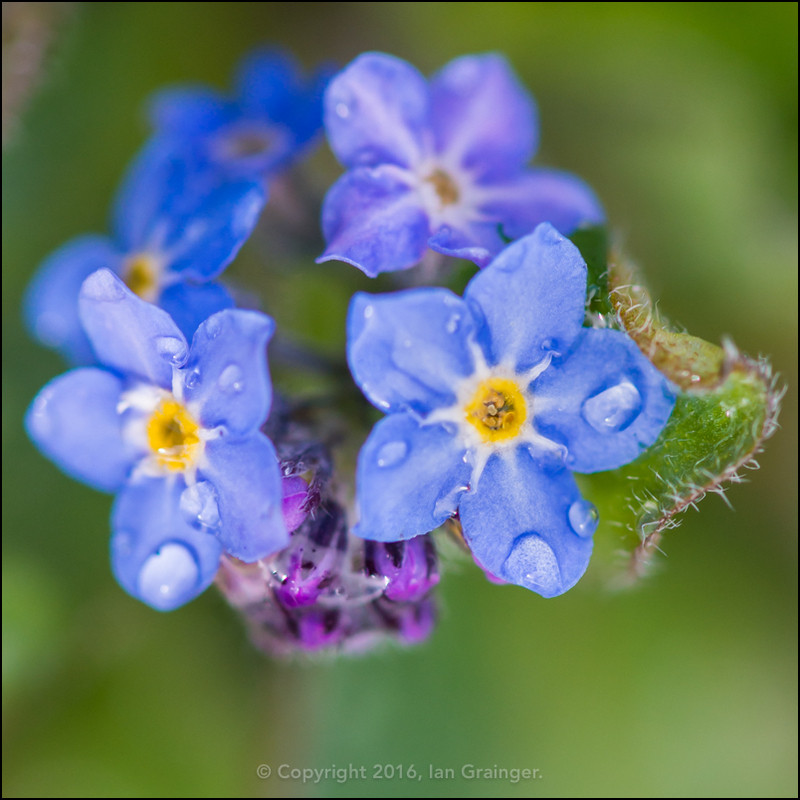 Other newcomers to the garden this week have been the Forget Me Nots (Myosotis), which have sprung up all over the place in my dad's garden. Growing close to the ground, they've been less effected by the wind and hail than most of the other spring plants. 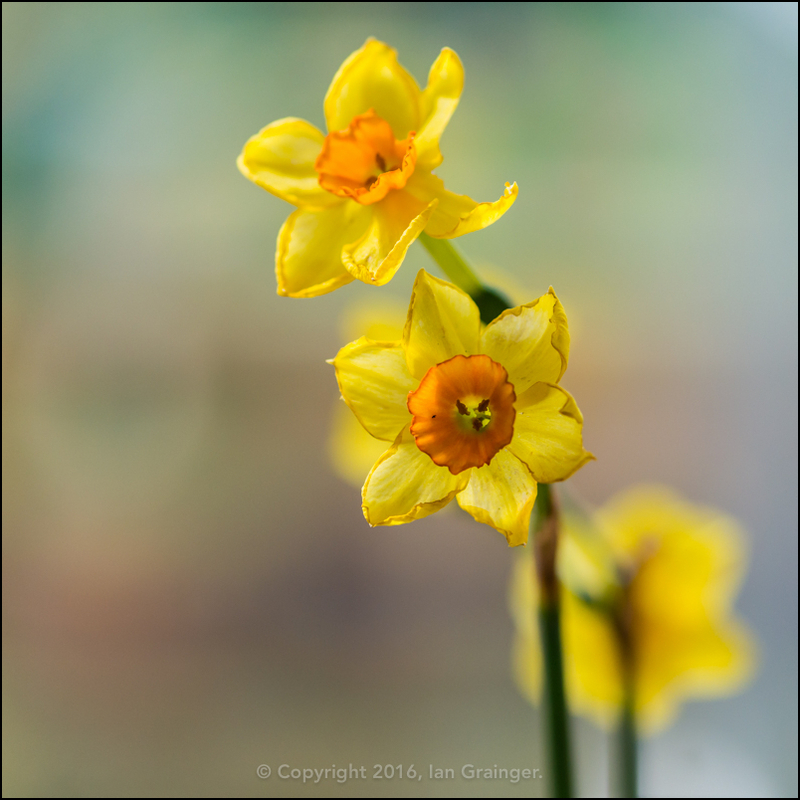 As spring gets under way, it's not only things we've planted that start making an appearance. 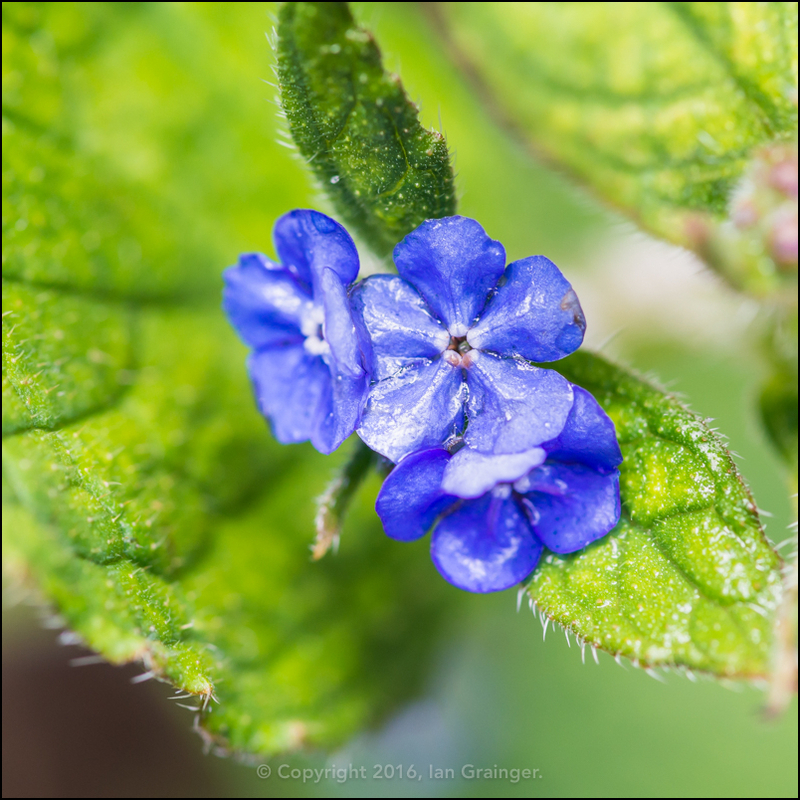 This Green Alkanet (Pentaglottis sempervirens) is actually a weed that can quickly take over a bed or border. However, I like to grow a little of it as it can look quite pretty, and will produce flowers until the first frosts. 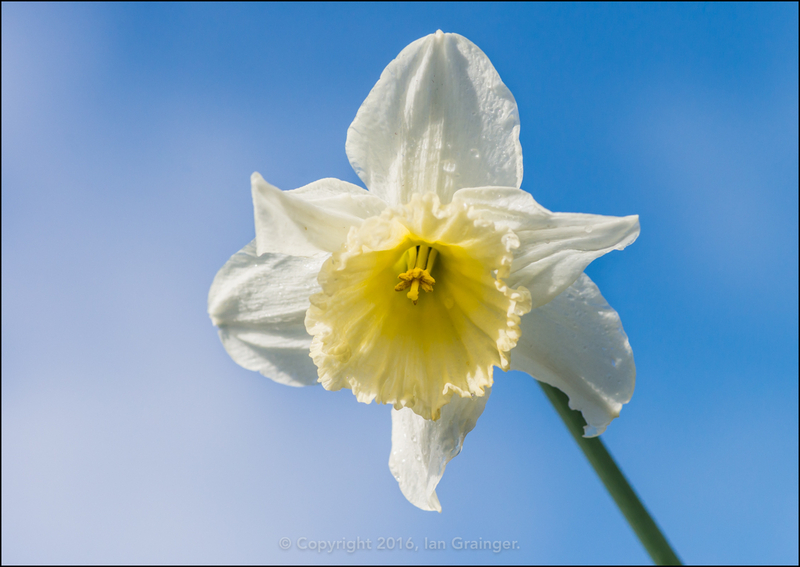 At last, the Daffodils (Narcissus) are putting on a very good display, and look particularly lovely in the morning sunshine, especially those that have been planted in drifts and rows. They look even better when there's a blue sky to view them against, although not a usual view, I admit, and I did get rather wet lying in the	grass while I took this shot, but I think it was worth it! 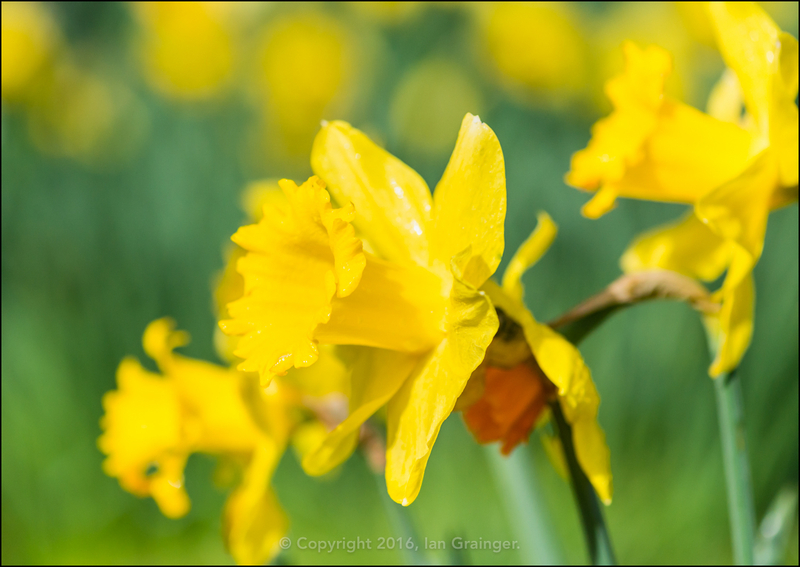 Unfortunately, Storm Katie arrived on Sunday evening and destroyed quite a lot of the Daffodils and Tulips that had taken their time to show their faces. Very disappointing, but at least I got to bring a whole lot of cut flowers indoors, like these small Daffodils that have multiple flower heads on one stem. 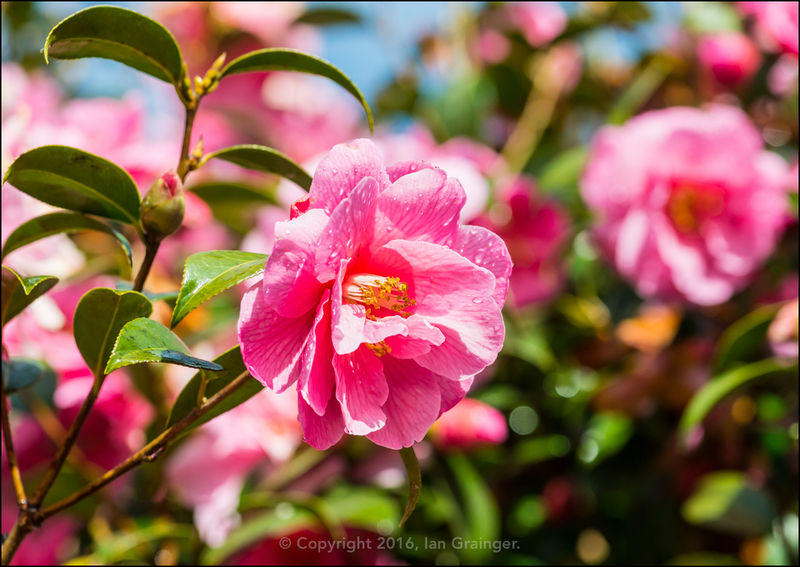 However, when the weather was at its best, it seemed like summer was just around the corner, and I think that the Camellia bush will continue to flower all year long! Finally, I thought I'd share with you my new garden acquisition. 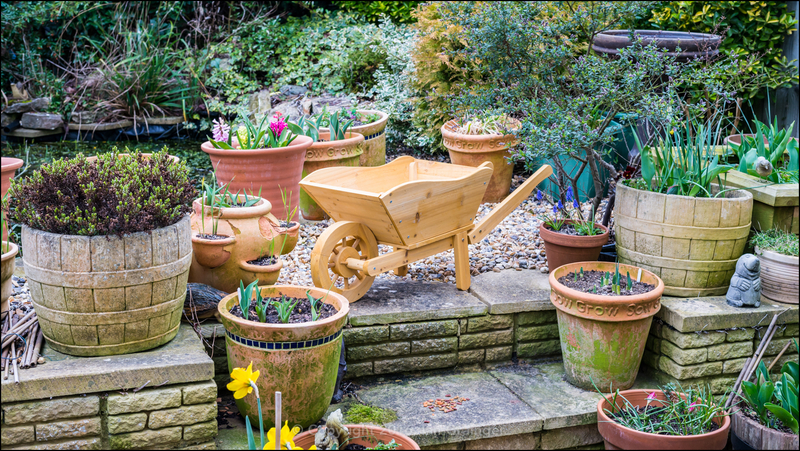 It's a small wooden wheelbarrow planter that I intend to fill with something like Begonia or Petunia plants later in the year. As you can see from the picture, I like to grow my plants in pots and planters as it gives me the freedom to move them around, and choose the best location in which to photograph them.